A recent episode of PBS' Religion and Ethics News Weekly highlighted a very interesting community in Israel called the Oasis of Peace (Neve Shalom in Hebrew and Wahat al-Salam in Arabic). 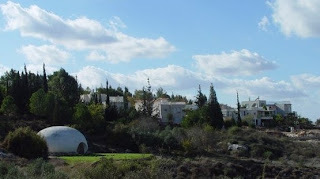 Nestled in the hills between Tel Aviv and Jerusalem is a small village called the Oasis of Peace—in Hebrew, Neve Shalom and in Arabic, Wahat al-Salam. While the Middle East conflict continues to churn all around, here they are trying to create a different reality, one that says Israelis and Arabs can live side-by-side in peace. Neve Shalom/Wahat al-Salam is, according to the community's website, "an intentional community jointly established by Jewish and Palestinian Arab citizens of Israel." Founded by an Egyptian Dominican monk who wanted to create a space for Jews, Muslims, and Christians to live together, the community focuses on education. The village has, in addition to over 200 bilingual Hebrew/Arabic primary school students, programs for visitors and youth summer camps to educate and develop ways for people to live in peace in this difficult and tense context of the current situation in Israel. These things don’t make the news. I often joke, because we don’t kill anybody, we don’t make the news and we don’t make page one anyway. So I’d like people to know that there are a lot of people in this country who are into dialogue, education, getting to know one another, trying to live together. They have, on their website, an FAQ. One of the most interesting I found there was regarding the use of the complicated term, "Palestinian Arabs of Israeli citizenship." The PBS page on the episode of R&E has a transcript in addition to the video, which I have embedded below. 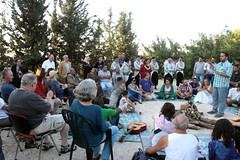 Watch Interfaith Village in Israel on PBS. See more from Religion & Ethics NewsWeekly.